This post is written by Crystal Gilliam and illustrated by Joyce Lee, both members of the TradeGecko content team. TradeGecko is a cloud-based inventory management software solution for SMBs. TradeGecko’s blog and knowledge base are full of tips and tricks for retailers and wholesalers on inventory management, ecommerce and logistics. Supply chain management. The term brings images to mind of warehouses, shipping containers, and people walking around in hard hats holding clipboards. It can seem complicated – and let’s be honest, it is. A supply chain is the multi-faceted backbone of your retail or wholesale business whether you’re selling online, in stores or doing a little bit of both. As with any major aspect of your business, there are probably lots of areas where you’re incurring more costs than necessary and some of these can definitely be streamlined. It’s worth taking a look at your supply chain as a whole to recognize areas where there could be fewer costs, which also means higher profits. If you’re not sure where to start, here’s a guide for cutting those costs and optimizing your supply chain. In the following, we take a look at six areas of the supply chain and how you can start to cut costs and streamline: inventory cost, inventory valuation, quality control, sales channels, warehousing and fulfillment logistics. Total inventory cost (TIC) is a large number that encompasses many aspects of one thing: the total cost of one of your most important assets. Total inventory cost is essentially all the costs that make up your inventory. Calculate this number to have an idea of what the inventory is costing you overall. When you break the total cost figure down, you can figure out which areas need improvement. Total inventory cost can be broken into 3 smaller costs: ordering costs, shortage costs, and carrying costs. Each of those three represent various aspects of the supply chain. Have a look into each part to identify where costs can be trimmed. Ordering costs are, as you might guess, all costs associated with ordering your inventory. These are usually fixed costs. Landed costs make up the majority of this figure. Landed costs equal the total price of your products including everything that happens up until the point when they arrive to you. They include the original price, transportation fees, taxes, insurance, handling and other fees. If you run an international operation, take a particularly close look at your landed costs: these will include customs, international taxes, currency exchange differences and import duties that you’re paying on your goods. To bring the total inventory cost down, ask yourself: does the extra landed cost justify bringing in your products from an overseas supplier or should you look into finding a local supplier? Shortage costs come from out of stock situations. Doing proper inventory forecasting, and finding your economic order quantity and ideal reorder points can reduce these costs greatly. Shortage costs get high when you need to make last-minute orders from other suppliers with even more last-minute shipping charges attached. Preventing this from happening in the first place is a good way to reduce these costs. Just be like the Boy Scouts: always prepared. Finally, carrying costs are a big one when you’re thinking about the total cost of your inventory. Ideally, they should only make up 20-30% of your TIC. Carrying costs include capital costs, non-capital costs and inventory risk costs. To reduce this cost to the recommended 20-30%, examine if there’s an alternative way to store your inventory with lower holding costs, change your service provider, or change your overall inventory management technique. For example, you may consider changing from just-in-time inventory management to drop shipping for certain products that bring you a high carrying cost. There’s something else that could be causing high costs in your inventory, and it’s something hidden down, deep down, in that one forgotten corner of your warehouse: dead stock. The name is a little melodramatic, but it’s a real problem for a lot of retailers. Dead stock is product that hasn’t sold for at least one year, and is slowly but surely becoming obsolete, out of season, or simply impossible to sell. However, against your better judgment, it stays in your warehouse, hoping for better days. Dead stock is a problem because, while it’s not making any money, it’s still costing money in the form of holding costs in your warehouse. It’s also taking up space that you could be using to store your newer stock that actually will sell. Accept that you’re going to take a loss on this stock, in order to stop its continuous drain on your resources. To get that stock moving you can just donate it all (in the US, and in several other countries, these donations are tax-deductible). Another option is to try product bundling, which will both get rid of existing dead stock and also reduce the risk of accumulating it again in the future. For example, if you have cameras and camera straps that fly off the shelves, but are left with too many camera bags, try creating a new product that bundles all three. Switching from external costs, another area to examine is your inventory valuation methods. Inventory valuation gives a value to all the items in your inventory and therefore, puts a value on the major assets of your business. If you don’t use the ideal valuation method for your product, your expenses and revenues at the end of the year may not reflect the reality of the situation. There are two main methods of tracking your inventory: perpetual and periodic. Periodic valuation keeps track of sales as they happen, but doesn’t update inventory until the periodic stock-take happens. Perpetual valuation keeps routine, updated record of the inventory on hand at any point in time. In the fast-paced world of retailing online, we highly recommend perpetual to keep your valuations accurate all the time. First-in, first-out (FIFO) in which older inventory is recorded as the first sold, regardless of whether the actual product itself was first or last in line on the shelf. Last-in, first-out (LIFO) in which the newest inventory is recorded as being sold first. The issue with the LIFO method is that it is rarely encountered in practice. If a company were to use the process flow embodied by LIFO, a significant part of its inventory would be very old, and likely obsolete. Weighted average costs, which uses the average cost of the goods sold to determine inventory value. This is the really short version of complex accounting processes, but it’s enough to get the message across: choosing which of these inventory valuation method you (and your accountant) use has an impact on your overall supply chain and inventory costs. Each gives a different valuation to your inventory, and therefore, a different overall financial state of your supply chain and business. As every business is different and financial reporting standards around the world differ, it’s best to discuss your inventory valuation method with your accountant. Where else in the supply chain are there potential inefficiencies? Still in the realm of your inventory, but this time at the manufacturing stage. Having to send products back before they even have a chance to be sold because of quality control issues represents a big cost to your business. Quality issues cause delays in shipments, unhappy customers and loss of revenue when you have to send things back to the manufacturer. There are several ways to reduce this cost – mostly by preventing them from happening in the first place. Establish your quality assurance standards when you first start looking for suppliers and manufacturers. Have a list of clear quality requirement that you have and make sure that the supplier you choose is capable of producing to meet this standard. Once you’ve chosen your preferred suppliers, ask for samples, give feedback on samples, ask for samples again and only then agree to do business. You will also have to put in some quality time at the actual factory to ensure quality standards are met once full-scale production starts. These are simple tips, but they are an effective way to ensure quality products from the beginning, which will help you cut costs associated with bad quality products over the long term. Let’s move on to another way to optimize your supply chain – but in this section, rather than talking about cutting costs, we’re talking about economies of scale and making more money! How about expanding your sales channels? This is less about expanding to add another retail sales channel, and more about making a bigger sales channel expansion: from retail to wholesale. In many cases, as a retailer, you may already have the foundation to expand into wholesale, such as a customer base, market knowledge and product knowledge. But the challenges really are: scaling operations, taking production or sourcing into your own hands, and gaining customers for the wholesale market as well. However, these are surmountable, especially when taking into account the potential profits that this channel can bring. If you move into wholesale, and decide to do it online, things will start looking even better for you as a part of the growing B2B ecommerce market. Frost and Sullivan predicts that the B2B ecommerce market value will grow to $12 trillion by 2020. Selling both retail and wholesale is rapidly becoming a good strategy as part of a multi-channel sales approach. What’s the process for expanding into wholesaling? Start slow. If some of your products are doing extremely well, and you have trouble finding quality suppliers for it, these could be good products to start with. Identify your target customers and work out the logistics such like storage, shipping and pricing. Wholesale as another sales channel can open up new bigger, better revenue streams, scale operations such as warehousing, shipping and production, and expand your brand reach to new retailers. Let’s move to another part of your process – order fulfillment. 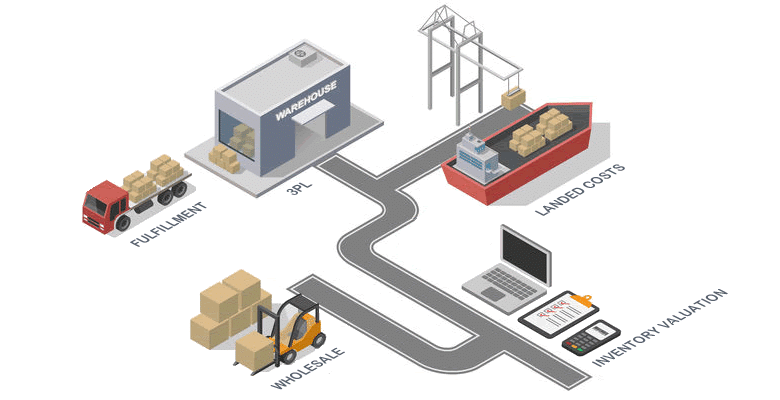 This includes pick, pack and ship methods and your warehouse layout. If your pick, pack and ship method has your warehouse employees running around like they’re on a deluded scavenger hunt, it’s time to rethink your process. Make sure your pick list is clear and detailed so that warehouse staff know exactly where to find things. Place products on shelves in an organized way that make sense within the overall layout of the warehouse. Place your packing station in a logical position, probably somewhere near the last of your product shelves. Finally, make sure shipping labels are clear and detailed for quick shipping once your packages are ready to leave the warehouse. Speaking of the “pick” bit, your warehouse layout should be organized and make sense. Make sure shelves and products are clearly labeled, items are accessible and it’s easy to navigate between rows and aisles. Pick, pack and ship and warehouse layout are some of the most basic aspects of order fulfillment, yet they can be the most time consuming and can incur big costs simply by being inefficient. Take the time to work out the optimal layout before you get started on anything else. Speaking of warehouse layouts, here’s a thought: do you actually need a warehouse in the first place? Or would hiring a 3PL to do it for you make sense for your business? A third-party logistics provider (hence the acronym 3PL), can make your dreams come true – if those dreams are of seamless fulfillment, shipping and taking care of your products all on their own. While 3PLs do come with a cost of their own, hiring one can be worth it in the long run – the trick is to work out how much you will save with one, and if it will be worth it. In the end, you can save on costs such as: warehousing, transportation, technology and staffing. Along with potential cost savings, a 3PL can add a lot of value to your supply chain that leads to other cost savings: namely in the form of knowledge and expertise. As a company that specializes in this sort of thing, a (good) 3PL brings knowledge about the industry, techniques and other resources that could take you years to discover. They focus on optimizing their processes, then you can focus on optimizing yours. When you scale your business, a 3PL brings more flexibility to that growth, with the capacity to take on higher volumes, and lead to your cost savings, and ultimately, profit as the business grows. More resources, and overall market knowledge. What service level do I need? Figuring out exactly what you need guarantees you won’t overpay for a service that is surplus to your requirements. Does the technology the 3PL uses for operations match my technology – are they compatible? What is the 3PL’s reputation within the industry and do they have good references from other customers? Your supply chain is a complex aspect of your retail business, that can incur a lot of costs and loss of time due to inefficiencies. To optimize your supply chain, it’s simply a matter of stopping to analyze it section by section to see what’s working and what’s not. Then you can focus on getting your product off your virtual shelves and into the hands of happy customers. Getting rid of dead stock is a fantastic tip!